Jeep vehicles use an electro-mechanical servo system. The system consists of a control module, speed sensor, servo, control switch assembly, vacuum storage canister, check valve and release system. Release system consists of a mechanical vacuum vent valve and brake and clutch (M/T) release switches. Cruise control switch is an integral part of turn signal switch lever and consists of 2 separate switches. First is an "ON-OFF" and "RESUME" slide switch located on flat of directional switch lever. Second is "SET/COAST" push button switch located at end of directional switch lever. To engage system, move slide switch to "ON" position and accelerate to desired speed. Depress and release "SET/COAST" button on end of switch lever. System will now maintain selected speed. System will automatically disengage when brake or clutch pedal is depressed. It can be re-engaged to previously selected speed by accelerating to 30 MPH and moving slide switch to "RESUME" position, then releasing switch. NOTE: When slide switch is moved to "OFF" position, pre-set speed of "RESUME" function is canceled from memory and must be reset when system is reactivated. Higher speed can be set by pressing on accelerator pedal until new speed is reached and then pushing "SET/COAST" button. Lower speed can be obtained by lightly depressing brake pedal, allowing the vehicle to slow to desired speed and then depressing and releasing "SET/COAST" button. Control module receives input voltage representing vehicle speed from speed sensor, which is driven by the speedometer cable. Control module has a low speed circuit that prevents operation at speeds below 30 MPH. See Fig. 1. Servo is controlled by control module and uses manifold vacuum to control throttle. Bead-link chain connects servo cable to throttle linkage. See Fig. 1. Control switch assembly is an integral part of turn signal switch lever. See Fig. 1. Release system deactivates cruise control system when brake or clutch pedal is depressed. Either servo vent valve or mechanical vacuum vent switch admits atmospheric pressure into servo when brake pedal is depressed. Fig. 1: Cruise Control System Components Courtesy of Chrysler Motors. NOTE: Vehicles with computerized engine controls, should be tested for stored computer codes. Codes and related problems must be repaired prior to cruise control diagnosis and repair. For additional information, see COMPUTERIZED ENGINE CONTROLS section. Restricted vacuum hose or no vacuum. Control switch or control module defective. Speed sensor defective. Clutch or brake light switch defective or misadjusted. Brake light switch wire disconnected. Open circuit between brake light switch and brake lights. Accelerate circuit in control module inoperative. Defective control switch. Defective control module. Mechanical vent valve not opening. Kink in mechanical vent valve hose. Brake light switch defective. Centering adjustment wrong. Servo link misadjusted. Improper servo chain adjustment. Vacuum hose connections reversed at servo. Defective servo. Loose wire connection. Loose vacuum hose connection. Servo linkage broken. Defective brake light switch. Reverse polarity of system wiring. Defective servo. Defective control module. Air leak at connections or in vacuum hoses. Air leak on vent valve on brake pedal. and cruise control remains inoperative, perform following adjustments to determine if control module is functional. CAUTION: Adjustment potentiometers are extremely delicate. Carefully insert screwdriver and do not push or turn screws excessively hard. Maximum movement is 3/4 turn. adjustments have no effect on cruise control, replace control module. counterclockwise. Recheck engagement speed and adjust as necessary. speed and adjust as necessary. Fig. 2: Control Module Adjustment Screws Courtesy of Chrysler Motors. Depress brake or clutch pedal and hold in depressed position. Move vacuum vent valve toward bracket on pedal as far as possible. Release brake or clutch pedal. control module before starting diagnosis or repair procedure, as this connection is disturbed when Cruise Command System Tester (AM PC-1-R) is used. Poor connection at this point may be improperly diagnosed as control module malfunction. Brake light and clutch switches should be properly adjusted. Ensure that all vacuum lines are correctly routed and tightly connected. Testing is performed with Cruise Command System Tester (AM PC-1-R). Remove wire harness connector from control module. Connect tester to wire harness connector. Perform tests as part of service diagnosis to determine cause and correction of system malfunction. Various tester lights are associated with specific components, circuits, etc. NOTE: Voltage checks should show battery voltage. If resistance readings are incorrect, check circuit for an open or a short. Cruise control module terminal No. 1 grounds through connector at engine block. Light No. 2 "OFF" (Control Switch & Speed Sensor) With control switch in "ON" position, check for battery voltage between HAZ/STOP and in-line fuse, terminal No. 5 and ground terminal No. 1. With ignition switch in "OFF" position, check resistance between terminals No. 2 and No. 3. Resistance should be 15-50 ohms. With ignition switch in "ON" position, install jumper wire between terminals No. 7 and No. 13. If brake lights do not turn on, check fuses and brake light switch connections. voltage between gauge fuses at terminals No. 7 and No. 1.
throttle resistance should be 4000 ohms. Light No. 5 "OFF" (Resume/Accel/Vent Valve) With control switch in "RESUME/ACCEL" position, check for battery voltage between HAZ/STOP and in-line fuse, terminal No. 10 and ground terminal No. 1. With ignition switch in "OFF" position, check resistance between terminals No. 6 and No. 12. Resistance should be 30-50 ohms. Resistance between terminals No. 6 and ground, and terminal No. 12 and ground should be infinite (open). 30-50 ohms. Resistance between terminals No. 4 and ground, and terminal No. 12 and ground should be infinite (open). (1) - Servo will pull throttle wide open. Keep RPM at a safe level by releasing cruise control switch. Use 12-volt test light to test control switch continuity. Connect test light to wires as indicated in CONTROL SWITCH CONTINUITY TEST CHART. See Figs. 3 or 4. Fig. 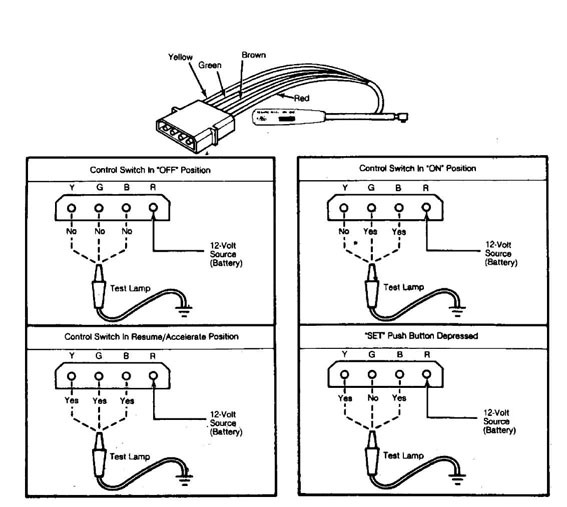 4: Grand Wagoneer Control Switch Continuity Test Chart Courtesy of Chrysler Motor. connected directly to source of voltage. lights No. 1, 3, 4, 5 and 6 should be off. With ignition and control switches in "OFF" position, test lights should be off. If one or more lights are on, remove Brown (5) wire at control module connector and check for direct source of voltage or repair defective control switch. sensor terminals to Gray and Drk. Blue wires, and check terminals No. 2, 3, 5 and 7 (Gray, Drk. Blue and Lt. Green wires are not grounded). 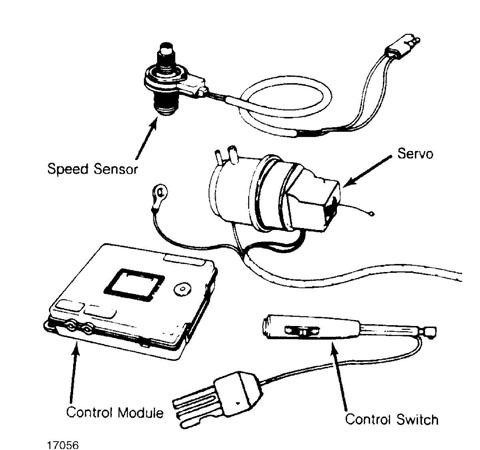 continuity of throttle position feedback rheostat of servo. module connector for continuity to control module. throttle position feedback rheostat on servo. CAUTION: If engine is running, servo will move throttle to wide open position. servo moves throttle to wide open position with engine operating. brake pedal depressed, lights No. 1, 2 and 4 should be on. Lights No. when brake pedal is released, check brake light switch adjustment. should be on. Light No. 1 should be off. Light No. 4 will dim when servo moves throttle to wide open position, if engine is running. connections to control module through Gray and Drk. Blue wires. Check terminals No. 2, 3, 5 and 7 (Gray, Drk. Blue and Lt. Green wires) for ground. If all lights are off after moving control switch to "R/A"
White wires for shorts. If necessary replace defective servo. control switch for continuity to switch. 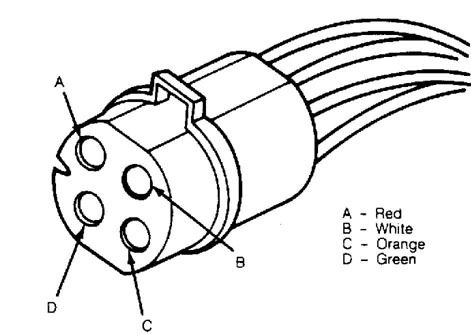 speed sensor connector for continuity to control module connector. adjustment. If light No. 4 is off, check for defective connection at terminals No. 2 and 11 on control module connector. Check operation of throttle position feedback rheostat on servo. a voltmeter (set on low AC scale) to terminals from speed sensor. freely) at 30 MPH and note voltage. (open circuit) resistance should be indicated for each wire terminal. terminal, servo has short circuit to ground and must be replaced. NOTE: Without sufficient load, solid state circuitry in control module will be damaged by excessive current flow. Fig. 5: Servo Wire Harness Connector (Except Grand Wagoneer) Courtesy of Chrysler Motors. touch Red and White wire terminals in servo wire harness connector. make sure that solenoid valves are working properly. charge valve is open and vent valve is closed. connector and throttle linkage to servo.